Procedure: Dissolve 1g of baking soda into 100mL of distilled water. Punch a few holes into the baby spinach with the hole puncher. Place the leaves in the syringe with the plunger taken out. Fill the syringe half way with water; push out excess oxygen near the top of the syringe. Tap the oxygen bubbles in the syringe until they reach the top; push out excess oxygen until all bubbles are gone. Place your finger over the tip of the syringe and slowly pull the plunger back to creat a vacuum-like effect. Make sure the leaves are constantly surrounded by water. The leaves should begin to sink to the bottom as the oxygen amount decreases within the leaf. Place this liquid and leaves into the baking soda/distilled water mix. Place a heat sink - shallow glass with at least an inch of water which absorbs the light's heat - on top of the beaker. The time it takes for the leaves to float is the rate of photosynthesis. Variables Affected? : If the concentration of CO2 is changed, then the result could potentially change. If there is a higher concentration of CO2 in the water then the rate of photosynthesis could potentially occur quicker than with 1g baking soda concentration. The purpose of creating a vacuum with a syringe is to pull all of the oxygen out of the leaves, which allows them to sink. The oxygen is replaced with water inside the plant cells. This occurs when the oxygen is pulled out of the leaf through the guard cells; the white oxygen space in the cross-section diagram decreases when the oxygen is pulled out. The leaf disks got the carbon dioxide needed for photosynthesis from the baking soda that was dissolved in the 100 mL distilled water. Oxygen in the leaf discs made them float. The light provides the disks with energy through the thylakoid membrane from the light reaction which spit s the water molecules. This creates bubbles of oxygen which, in turn, makes the leave buoyant; this allows them to float. Hypothesis: 1a will perform cellular respiration the most because it contains only germinating peas, which are already performing cellular respiration at a steadier rate than the non-germinating peas and the glass beads, which will not perform cellular respiration. (From bottom to top) The respirometers have a piece of absorbent cotton soaked with 4 drops of 15% KOH-, a non-absorbent piece of cotton, and varying amounts of alfalfa seeds and glass beads (see next paragraph). 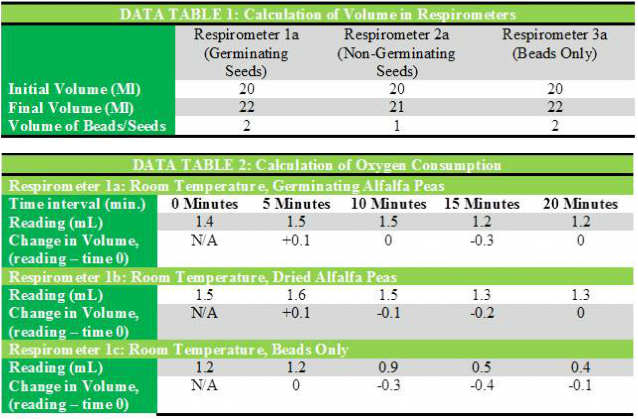 (From left to right) Respirometer 1a is filled with 25 germinating alfalfa seeds, respirometer 1b is filled with 25 alfalfa seeds and 38 glass beads, and respirometer 1c is filled with 30 glass beads, making the volume equivalent to 22ml in all three respirometers when filled with 20 mL of water at 15 degrees Celsius. 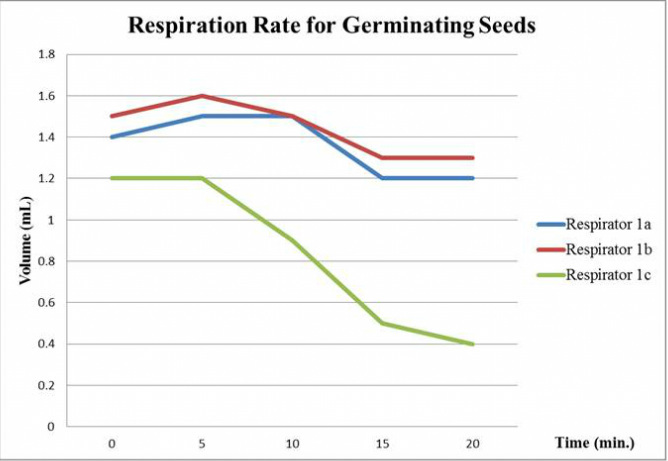 According to the data, the germinating seeds underwent cellular respiration at a higher rate than the non-germinating seeds. However, after 10 minutes, all of the respirometers began to decrease at a steady rate. This may have been caused by having less than enough KOH-; a small amount of KOH- would only be able to remove some of the CO2. Once the KOH- runs out, the CO2 began to increase within the test tube and pushed out of the respirometer. Therefore, the CO2 level begans to increase, and the oxygen could not get into the respirometer. The rate of oxygen consumption for the germinating seeds from 0 to 5 minutes was 0.02mL/min. The beads acted as a control group; they allowed the viewer to make rate comparisons to the germinating/non-germinating seeds. This also allowed for the volume of water to be equivalent in each respirometer. The KOH- removed the carbon dioxide, created by the seeds, which allowed the oxygen to make its way through to the respirometer chamber. The respirometer experiment allowed the viewers to easily measure the rate of respiration.